I have had two solid evenings this week to start working on the dress for my cousin’s wedding and have not done one thing on it. The Vera Wang fabric stares accusingly at me from on top of the sewing machine. 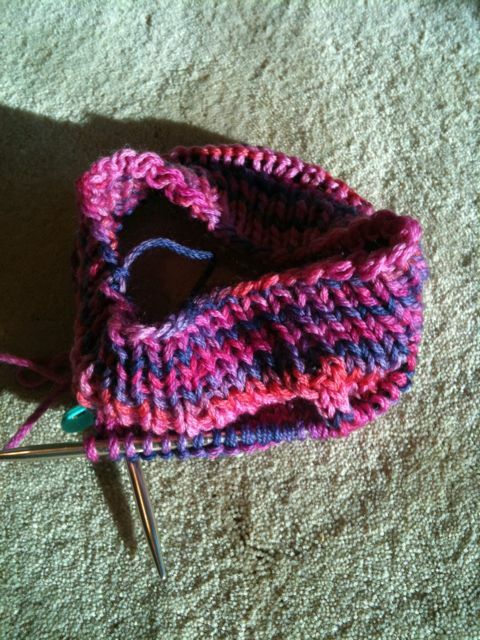 In fact, I spent all of last night helping a friend learn how to knit and uploading old photos onto Facebook. So if you came here looking for sewing progress, you came to the wrong place my friends. Apparently, I am MIA in the sewing room. Apparently, my MO is to sew at the last minute, backed into a corner. This dress might end up being named Disaster Dress or Dress of Doom. I hope not. How many times can I say I am going to start my dress before you guys start yelling at me to stop crying wolf? If anyone can loan me some of their sewing mojo, I would much appreciate it. Thanks! In knitting news, I decided on the Peasy pattern for my cardigan and already ordered the yarn. It should be in my greedy hands by next week. Yeah! 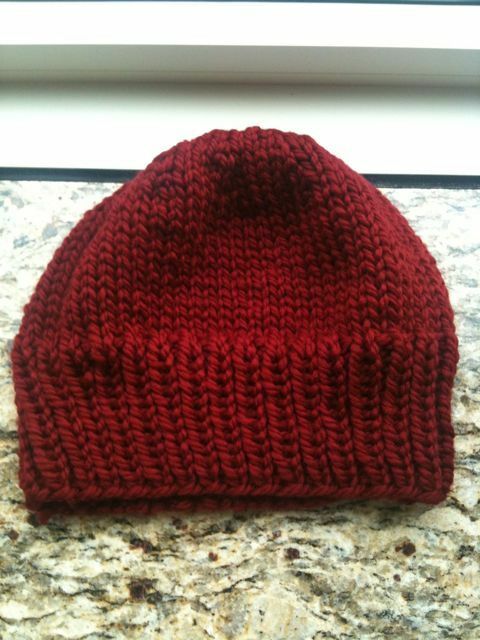 I just finished knitting this super easy and quick hat for a charity project to benefit Young Runners. My particular hat will be going to a young runner in Far Rockaway. It’s a really simple pattern: 3 inches of ribbing, then 3 inches of stockinette and then several rounds decreasing every other round. Even though it was such a simple project and was so fast to finish, I found myself really enjoying the knitting of it. I guess I miss knitting more than I thought. I think my last bit of knitting last year was all KWAG (spoof on the Selfish Seamstress’ SWAG but as knitting with a grudge) thereby making the process of knitting stressful due to time constraints and with no payoff to me. 😉 As a matter of fact, I think my poor niece Haley never got her winter hat. Bad Auntie!!! Anyway, I was talking to Robin yesterday about my newfound knitting love. You see, I know how great a knitter she is having seen many a gorgeous sweater that she’s made on her blog. Robin regularly adjusts knitting patterns for better fit and tosses out terms like top down knitting or talks about how she creates spreadsheets on the changes she makes to the patterns she uses. We’re talking knitting goddess here! I’m a fumbling newbie with knitting compared to her. So I turned to Robin for advice on my next knitting project hoping she could direct me to the perfect pattern. I would like to actually wear whatever it is that I end up knitting, so the bar is high for this project. Ideally, the pattern would be for a cardigan that wasn’t too difficult yet had some interesting detail like a simple lace or maybe some cabling. Something that wouldn’t take two years of tedious knitting to finish. Something that would be a great topper for a dress or top to tie a whole look together. I would like to use a natural fiber that had some nice drape. I haven’t decided which one I will do yet, but I definitely have a great bunch from which to choose. Incidentally, I passed by the new Purl store in Soho last night on my way to a dinner date. It looks soooo pretty. Unfortunately they were closed and I was just going to make it to the dinner on time, or I would have stopped in to buy some yarn. I will have to decide before my trip so I can take the project with me. You know what they say about idle hands! Besides, my sister says that I always need to be entertained. I’m not sure that’s a compliment though. I was supposed to go out tonight with the girls, but Jack’s sick and I think I need to stay home tonight. So instead, I will start my new version of B5147 for the wedding which is *gasp* two weeks away while keeping an eye on the baby monitor and Jack’s breathing. So many people forwarded this NYT article to me today. It could have been written by me it was so similar to my sewing experience thus far: my new machine, my sewing failures, my grandiose ambitions and dreams. I guess this means sewing has hit the big time again if it’s showing up in random places in the NY Times now. It’s a very funny article. My head is not so big after completing my trench coat that I am just lying around eating bonbons. I have been knitting and will soon be sewing. I am still working on my two knitting commissions (one is done already) and I got into my fool head that I could sew up some pj’s for Xmas for the kids in the family. And so for the next week, give or take a couple of days, I am running a sweatshop out of my apartment with nary an elf in sight. 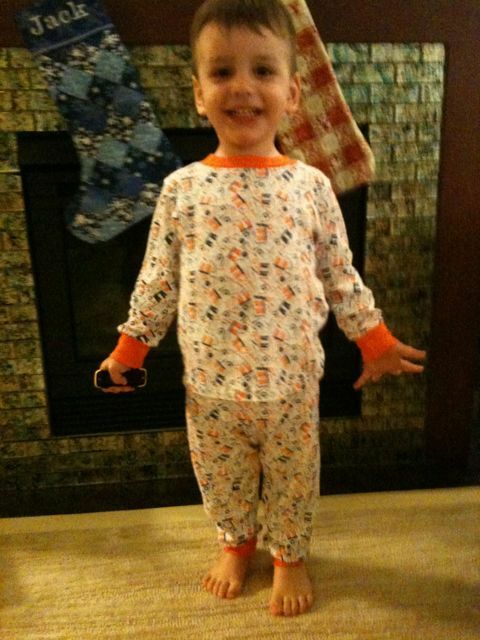 Here’s the pattern I’m using for the pj’s, Kwik Sew 3510. It comes in sizes 1T-4T. I will be making 2 sets of the 2T and one 3T and one 4T. I bought the cutest fabrics! But you’ll have to wait until I actually give the gifts to see them. At least one of the parents of the recipients might be reading this post. Well at least she better be, being my sister and all. 😉 This pattern says it’s a Kwik Serge pattern, so here’s to hoping this is a quick and easy project. I’ll post pictures of the commissions as soon as they’re gifted. Don’t want to ruin the surprises! 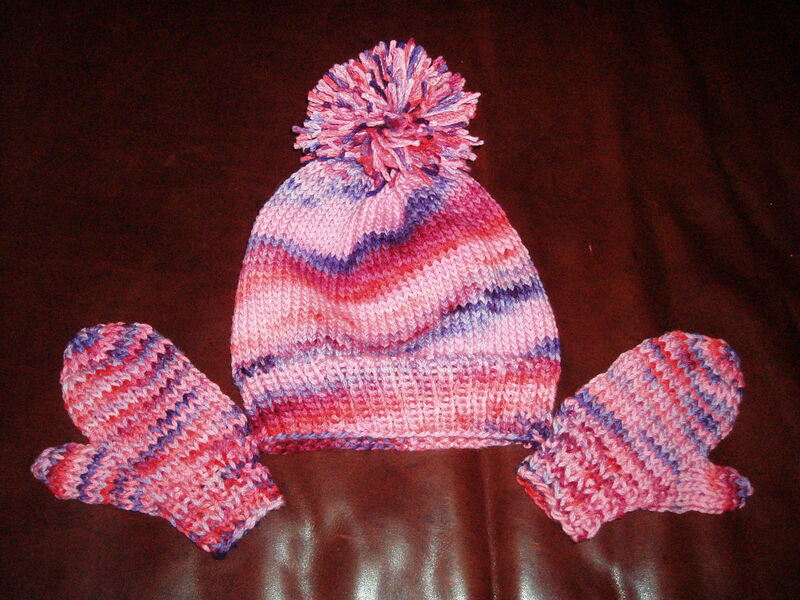 After posting about my first knitting commission, I have received two more requests for matching hat/mittens sets. One from my sister-in-law for my beautiful niece Haley and the other from my friend Jennifer of Jennifer Weisbord Photography. Remember when I mentioned that I had Jack’s picture taken professionally recently? Well, we worked out a deal where I will make her daughter Hannah one of the hat/mittens sets in exchange for use of the digital photo files of a few of the pictures she took of Jack. I want to order Xmas cards using those images and I wanted to use one image for the blog to show you the sweater I made on Jack. Jennifer takes the most beautiful pictures. I love how the colors just pop and how she expertly frames each picture so that the subject is so wonderfully shown. My neighborhood has some beautiful parks right next to the Hudson River and our photo shoot used this built in background to great advantage. Jack loved running around the park and playing on the jungle gym. Jennifer’s shots were candid and so effortlessly caught Jack’s personality and joy. I have been such a failure at catching his smiles myself, but she seems to just draw it out him. 🙂 Have a look and see! If you live in the NY Metro area, I highly recommend Jennifer. She’s great with kids and takes the most beautiful photography. Did I mention that Jack already lost his hat that I made recently??? Yes, and it’s not even winter yet. So I had to make him a new one. Since the old one (hard to use the word old on something not even two months old!) was slightly too large, I went down a needle size and now the hat fits just right. Now it’s just so right that one might even say it’s almost overfitted. But I am done with this one and if it’s a mite tight, oh well. Here’s a pic of the latest hat. I’m not going to say it’s the final hat, because I have a sneaking suspicion that he might lose this one before the bitter end as well. Should I make a tassel or a pompom for the hat? I am leaning towards pompom, but wasn’t sure if that was gender appropriate. What do you think? And then I have to make the mittens too. And next I want to make myself this scarf in the same color family. I know I never got around to posting about the trench coat, but I promise that by this time tomorrow, I will have posted it on the Trench Sew Along. I promise. Really. No, really! I mean it. Seriously. I was able to complete Jack’s sweater in time for his Christmas card picture photo shoot. And he looked super duper cute with the biggest smiles I have ever seen. Unfortunately these photos aren’t available for me to post on the blog as they were taken by a professional photographer and I don’t have digital files of them. 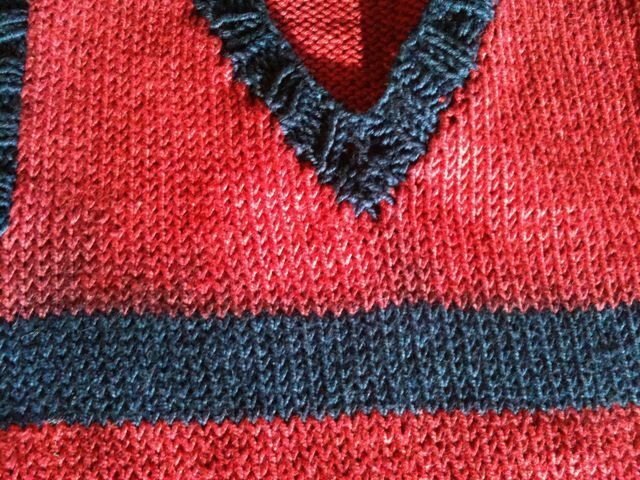 But to satisfy (albeit somewhat unsatisfactorily) your curiosity, here’s the sweater without a little 2 yr old in it. Also, in somewhat sewing related news, I did a major overhaul of my apt/sewing studio. Story and pictures tomorrow… I know, I’m such a tease. I’m happy to be back and have missed being connected to you all. I just have been overwhelmed with projects and too little time to blog and comment on other people’s blogs. But hopefully my time commitments will ease up. My apologies for being absent the last week. I have been under the weather morale-wise. Although my ennui has nothing to do with sewing, I haven’t sewn a thing since my last lesson with Thea where we figured out what was wrong with the raglan sleeves on my trench (more on that later). I have been knitting though. I started the commission and my son’s yearly sweater. I find knitting, especially patterns I’ve done before, very therapeutic. It builds my confidence while keeping the feelings of accomplishment going. Hopefully I will snap out of this mental malaise soon. Happy knitting and sewing to you all.